The San Francisco Fall Antiques Show, now in its 34th year, is the oldest and most prestigious art and antiques fair on the West Coast. 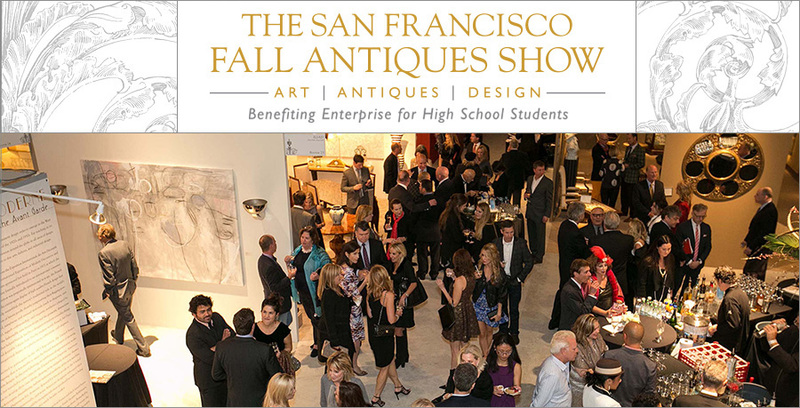 Held at Fort Mason each fall, the FAS presents 60 of the finest art and antiques dealers from around the world and is fully vetted by the vetting committee, organized in cooperation with the Antiques Dealers Association of California (ADAC). It is a must-see destination show for collectors and enthusiasts of art, antiques and design. Objects exhibited and sold on the show floor span the ages, from antiquity through the 20th Century, covering genres including Fine Art, Modern Art, Furniture, Textiles, Photography, Asian Art, Carpets, Ceramics, Porcelain, Sculpture, Rare Books, Works on Paper, Objets d’art, Jewelry and Metals. The 4-day show offers the opportunity to immerse yourself in the world of great art and antiques with programming each day, including The Lecture Series, featuring 6 prominent speakers over 3 days, show tours, talks, designer events and the Young Collectors Evening. The Fall Antiques Show opening night Preview Gala has been called “the highlight of the San Francisco Social Season” and opens the show with live music, caviar and vodka bars, flowing champagne, sumptuous buffets and the first glimpse of the best art and antiques from around the world, all available for purchase.